Lacto Calamine Oil Balance Face Scrub helps remove dead skin and absorbs only excess oil, which when used twice a week gives beautiful glowing skin. Kaolin Clay absorbs excess oil without removing the essential nutrients from the skin, Glycerin retains natural moisture in the skin and Cinnamon extract helps in preventing pimples by its anti-germ properties. It gently removes dead skin cells. It absorbs excess oil and maintains the oil balance. It prevents acne and pimples. Additional Information: Lacto Calamine is a famous skin care brand introduced by Piramal Healthcare. 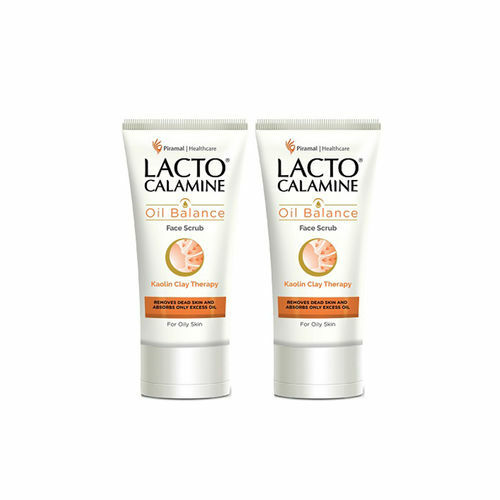 Being a trusted skincare brand for more than 30 years, Lacto Calamine is known for their Oil Control lotion that provides you up to 8 hours* of oil free skin. With its roots deeply ingrained in providing ?Oil ?free, problem free skin?, the brand has always defied the stereotype of being obsessed with one?s looks.